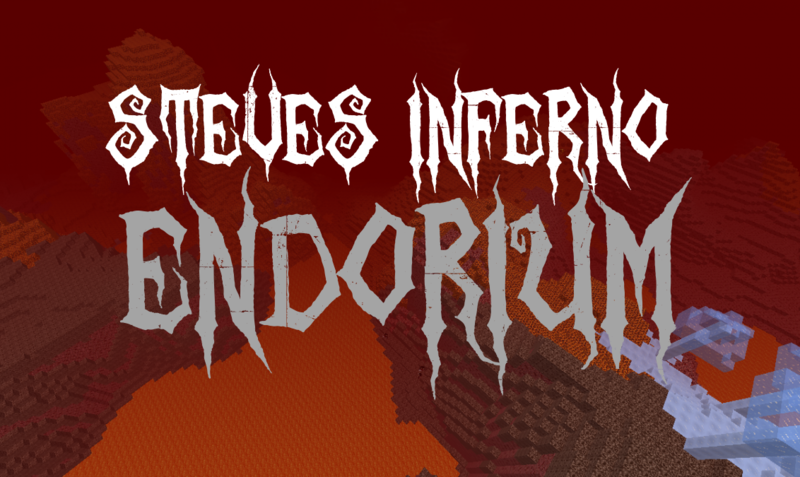 Steves Inferno is a mod that amplifies the demonic aspect of minecraft! It has an Adventure Aspect as well as progress through play system, Meaning you will be granted better items through playing! The Demon which upon killed drops a demon heart! Lavasnail which drops magma cream! Wheras what we call "The Nether" seems to mostly contain demonic beings, this dimension contains the sinners, as well as some other unholy beings. It consist of several biomes, which are as follows; "Treachery" "Anger" "Fraud" "Limbo" & "Heresy"
In this dimension you will encounter tortured souls, being beated and suffocated to death, only to respawn at once, and repeat for all eternity, wandering in Limbo and tortured by Fraud. You will encounter beings filled with anger, doomed to tear eachoter apart for all eternity, and fallen angels torn by their treachery! The portal to the Heavens is made with gold blocks and lit with a Angelic/Purified rod. The Heavens consists of 1 biome which is Edens Garden. Here you will find the holy spirits, as well as guardian angels. To get the angelic rod however you will need to obtain angel hearts. If you put toghether 1 Demonic Dust as well as 1 Unholy Dust, you will recieve 1 ravaged dust. This will cause the heavens to answer with force! Be prepared! The strongest sword, called "Morningstar" can be crafted with the hearts of the holy ones. Doing so, will result in Lucifer, Satan himself spawning in. I do recommend to do so in the Heavens for full effect! Once you have defeated the devil himself it is time to enter darkness! Building a portal of End Bricks and lighting it with the Devils Heart will lead you into the endorium. A place where existence is a lie, and dark beings lunger for flesh. Through the dimensions you can gather usefull items. Drained Armor can be crafted by usinig unholy ingots. This is crafted with 3 unholy fragments, which you get by smelting the hearts of fallen angels. Fire Essence Chestplate can be crafted with Bolk of Fire Essence, and item which is gathered by taking 9 of the hellkeepers fire essence toghether. - By holding Fire Essence in your hand you are powering the chestplate, granting you fire resistence. Be sure to stack up! Morningstar sword is crafted with the hearts of the holy ones! It is way stronger than diamond and quite useful! Also craftable are "Shulker Helmet" & "Nighttime Generator"
How do i get a custom mob to go to my dimension? also.. how do you remove other mobs from your dimension? @#1 If I understand your question my dear, what you need to do is to create biomes, with a 0% spawn rate, and choose following biomes as the biomes of your dimension, as well as choose your custom mobs only to spawn in said biomes. How Do I get a custom mod to have custom drops. Each time I try it drops what the AI base is like if I'm add custom things for it to do I first have to choose an AI base but each time It never drops what I want (and if it does its so rare), also I like your mod. @#3.1 You don't have to pick an AI base, at least not with the latest version. You can simply leave the base at none and add the tasks instead. To make the mob agressive you just add the task "Act Agressive Against" and "Attack on collide". @#3.1.1 Thanks and great mod, made minecraft more dangerous and fun I also got trolled from the portal the devil.